The first teaser poster has been unveiled today for Zack Snyder's 'Man of Steel' starring Henry Cavill as Superman, Adams, Michael Shannon, Kevin Costner, Diane Lane, Laurence Fishburne, Antje Traue, Ayelet Zurer, Christopher Meloni and Russell Crowe. 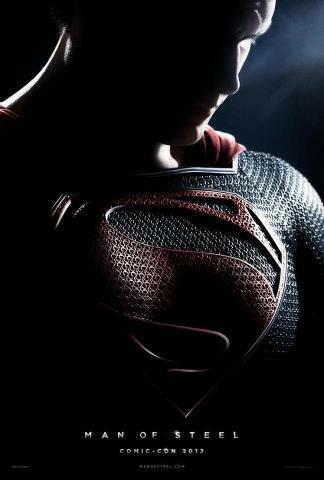 Henry Cavill plays Superman in the June 14, 2013 release. The film also stars Amy Adams as Daily Planet journalist Lois Lane, and Laurence Fishburne as her editor-in-chief, Perry White. Starring as Clark Kent's adoptive parents, Martha and Jonathan Kent, are Diane Lane and Kevin Costner. Squaring off against the superhero are two other surviving Kryptonians, the villainous General Zod, played by Michael Shannon, and Faora, Zod's evil partner, played by Antje Traue. Also from Superman's native Krypton are Lara Lor-Van, Superman's mother, played by Ayelet Zurer, and Superman's father, Jor-El, portrayed by Russell Crowe. Rounding out the cast are Harry Lennix as U.S. military man General Swanwick, as well as Christopher Meloni as Colonel Hardy.